Study of Calcutta ghats proves to be challanging. The different names a ghat often called by require tracking and linking one another to tell its story of ups and downs meaningfully. Mullick Ghat is one of its kind and of great historical significance. Mullick Ghat took part in the history of making the river water resources useful in public life. The Corporation set up a Pump Station there to distill river water for supplying to the city. A dynamo was installed there on August 19, 1879 to illuminate the Bridge 1,528 ft. long and 62 ft. wide. [ See: Grace’s] The Ghat was also famous for launching passenger and cargo steamer services. Mullick Ghat still exists, bereaved of its stately look that once prompted Evan Cotton to speak of the ‘handsome masonry structure of Mullick Ghat, which stood ‘immediately to the north of the Howrah Bridge’. We must note that Cotton wrote it before 1907 and the Bridge he referred to was the old Pontoon Bridge. As we have come to know from a recent survey, Mullick Ghat at present has a large and ornate square pavilion while the ghat itself has a more ‘native appearance’ [ See: ETH Studio]. The first photograph of the ghat we find was taken by P.A Johnston & Theodore Hoffman about three years after they established ‘Calcutta Studio’ in 1882. The shot must have been taken before Johnston died in 1891. The British Library (BL) does not specify the Ghat name. They provide instead a generic Title: Calcutta. Bathing Ghat. If I am not wrong, photograph titles are assigned, as convention, adhering to what the photographers or the original collectors stated. BL however takes the liberty to name it Chatulal’s Ghat in their descriptive note and subject tags, presumably on the basis of common belief and order of the day, which are apparently subject to change. The other photograph, featured at the top, depicts the same bathing ghat, taken by the same photographers and possibly around same time. As Evan Cotton had stated, the bathing ghat, stands on the east bank of the Hooghly River immediately to the north of the bridge. The panoramic view of the Bathing Ghat, shows no bridge in view northward, since the Pontoon Bridge to its south remains downstream and out of frame. BL provides more details of the pavilion; we are told that the pavilion was ‘crowned by a substantial structure in European classical style, topped by a drum’. As for its date, BL estimates that the ghat ‘was in position by the mid-1870s, and still standing in the mid-1940s, but has since been demolished’. 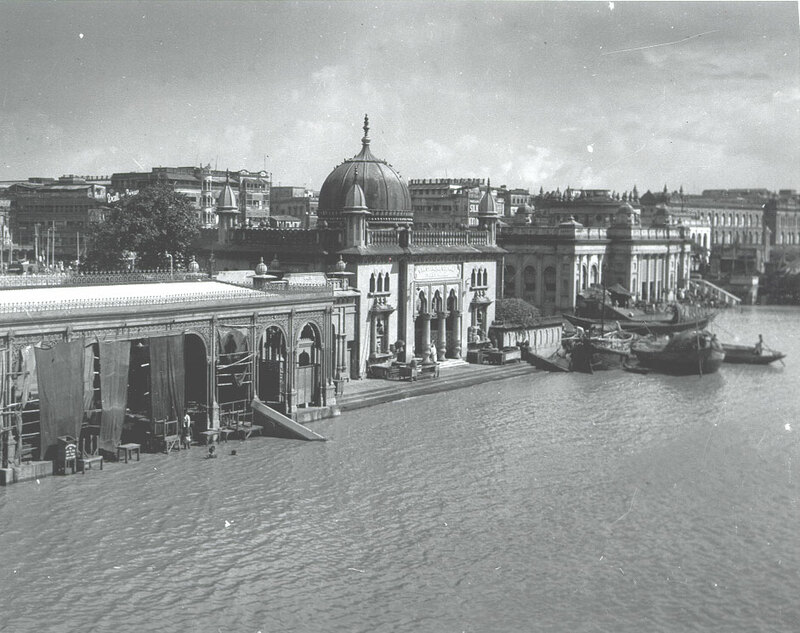 It was probably the last photograph of the ghat taken by Glenn S. Hensley in 1944 which incited BL to guesstimate the date of demolition, if demolished at all. By trailing the cue of the two renderings noted at hundred year interval by Evan Cotton and ETH Studio, we find half a dozen of matching photographs, but astoundingly none citing Mullick Ghat, but two other ghat names, Juggernath Ghat and Chatulal Ki Ghat. The descriptions best fit to the edifice presently stands on the riverbank a little high up with an added floor close by the Howrah Bridge, as shown in the photograph below. We may accept the edifice as the original pavilion of Nemai Mullick Ghat, subject to further verification. The Mullick Ghat we find today is still a popular site, mostly under the guise of ‘Chatulal Ghat’, hunted by movie-makers and tourists, functions nowadays as dharamsala. The pavilion has lost its old glory. There is no ornamental dome. An additional floor at the top makes its façade unbecoming. A loud paint colour covering the sandstone wall has lifted its elegance and sobriety. The look is now changed beyond recognition and can give a miss to anyone unguarded. More so, because of its borrowed name, Chatulal Ghat, by which it is known today in lieu of Mullick Ghat. 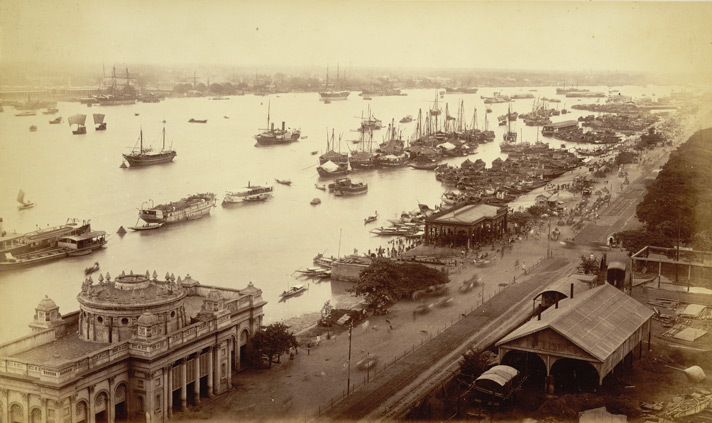 The anomaly that troubles us in identifying the particular bathing ghat, as represented in all the photographs posted here, has become more upsetting since 2014 when the following glass plate, which looks like another Johnston & Hoffman photograph(c1885), was brought out with supplied caption: The view of Kolkata’s Chotulal Ghat, as seen from Howrah Bridge. Interestingly, it was just a year before the name Chatulal’s Ghat was inscribed for the first time in a published map: City of Calcutta Census Map drawn in1913 by Richards [ See: Richards] and goes missing again in the City of Calcutta Map drawn by Wagner & Debes published next year in 1914. Chotulal_Ghat_In Richards 1913 CalcuttaCensus Map. Courtesy: Harvard Lib. Chatulal’s Ghat never shows up in any of the earlier maps of Calcutta, so far I could see. The list of 39 bathing ghats existing in 1793 [ See Harisadhan], or the list of 58 bathing ghats existing in 1874 had no place for Chatulal’s Ghat. [ See: CONES]. In fact, other than some blogs and the 1913 map of Richards, there is hardly any historical and descriptive accounts of Calcutta, including directories and handbooks, that refer to Chatulal’s Ghat. Whatever little we know of Chotulal of Chotulal’s Ghat from the recent blogs provides hardly any clue to establish that Chatulal was alive in mid 19th Century taking part in some historical events, like launching steamship to chandbali. [See: Basu] We understand from an article, “Heritage Ghats of Calcutta – Chotulal Ghat” in Noisebreak 29 Oct 2016 [http://noisebreak.com/?s=chotelal] that it stands next to Jagannath Ghat along the Hooghly River. The ghat was named after Chhotelal Durga Prasad, an eminent practicing lawyer at the Calcutta High Court. As we know from another source, some Chotelal Durgaprasad did actually exist who appeared in Allahabad High Court on 23 August 1938. [See Indian Kanoon]. As the Noisebeak story suggests, Chatulal Durgaprasad was seemingly already a middle-aged man before the ghat constructed; and if not quite impossible, it is somewhat difficult to imagine him pleading in 1938. Furthermore, to call Chatulal’s Ghat a heritage ghat, presupposes its having an extraordinary past – a tradition that reminds us of the philanthropic contributions of its founder, like a Sobharam Basak, or a Nemaichand Mullick, for example. This is after all an issue to be considered by the INTACH Kolkata Chapter. For us it is more critical to find the exact location of Chatulal’s Ghat on the eastern bank of Hooghly. We know from the blog stories that Chatulal’s Ghat stands ‘next to Jagannath Ghat along the Hooghly River’. According to Harisadhan (1915), and the latest river survey (2008) the next ghat to Jagannath Ghat is none but Mullick Ghat. The position of Mullick Ghat cited in historical maps of Calcutta overwhelmingly proves that Chatulal’s Ghat is an out of place notion. Fact remains that we have not yet found evidence, besides the solitary example of the 1913 map of Richards, to establish that a ghat called ‘Chatulal’s Ghat’ does independently exist and actually founded by Chatulal Durgaprasad. There remains, however, a likelihood of restyling Mullick Ghat as Chatulal’s Ghat unceremoniously. In a recent article on ‘Mullick Ghat’, Rangan Dutta writes that the steamship ‘Sir John Lawrence’ sailed on May 25, 1887, from ‘Kolkata’s Chotulal Ghat (also called Mullick Ghat) for Chandbali.’ [See: Dutta] It is all important for me that he maintains, as I do, the idea of Chatulal Ghat as an alternative name of Mullick Ghat, although the name ‘Chatulal Ghat’ was possibly introduced long after the ominous day of 1887. These two historical bathing ghats, once situated close by, are also renowned for providing regular ferry services. Though there should be no good reason to mixing up their identity, quite often the Armenian Ghat is taken mistakenly for Mullick Ghat. Yet structurally, materially and stylistically the two were entirely different. Armenian Ghat illustrated as Mullick Ghat. JUGGERNATH FERRY SERVICE AT MULLICK GHAT? ‘THIS STONE IS DEDICATED BY A FEW ENGLISHWOMENTO THE MEMORY OF THOSE PILGRIMS, MOSTLY WOMEN, WHO PERISHED WITH SIR JOHN LAWRENCE IN THE CYCLONE OF 25TH MAY 1887’. The Report of the Marine Court of Inquiry to the Government of Bengal found that the Sir John Lawrence was carrying more than her proper complement of passengers and that the tragedy occurred due to the shipmaster’s irresponsible navigation. The report led to an uproar and the demand for the railways to Puri became loud and clear, which had been constantly pushed aside by the Bengal Government since 1860s when two British promoters, Marshman and Stephenson, mooted a plan for rail link between Kolkata and Puri to allow pilgrims irrespective of caste and creed. Government also turned down another proposal for a direct Rail link between Calcutta and Madras via Orissa coastal plains that Baikuntha Nath De did submit in 1881 for a direct rail link between Calcutta and Madras through Orissa’s coastal plains with a branch line to Puri, which promised to provide a faster and safer means of transport for the Jagannath pilgrims. During 1870s, around 6,00,000 pilgrims visit Puri every year, which would guarantee a lot of profit. Taking advantage of the numbers and government ignorance, some foreign companies started steamer services from Kolkata to Chandbali in Orissa, now Odisha. As the fares were high, it was mostly children and women who would take the steamers, while the men take the unpromising journey by Jagannath Sadak. Tarinikanta Lahiri Choudhury penned his own appalling experience of the journey to Puri by Jagannath Sadak. In the latter half of the 19th century when the railways came into existence, the significance of waterways as inland trade routes declined, as the railways were faster and safer. [See: Goyal] It has been found, however, that the steamer navigation was being continued as an auxiliary service to Rail Companies for transporting passengers and cargoes, and for river excursions as well (vide পথে বিপথে / অবনীন্দ্রনাথ ঠাকুর। বিস্বভারতী and নদীপথে / অতুল গুপ্ত, জিঙ্গাসা ). As shown in the following two documents, (1) Bradshaw’s Condensed Schedule Assam-Sunderbuns Despatch Service, and (2) a Cargo Delivery notice from Rivers Steam Navigation Company Limited & India General Navigation and Railway Company Limited dated 2.10, 1912, steamer services were being provided till 1912 from several ferry ghats on Hooghly, including ‘Juggernath Ghat’. The steamer ghat, printed on the delivery notice and in Bradshaw as Juggernath Ghat, makes us curious about its possible location, or more precisely, if this is the same historic bathing ghat, the ‘Jaganath Ghat’ of Shobharam Basak, now reduced to a homely embankment with a long shade to the north of the existing Howrah Bridge. The other possibility remains for us to consider if the ghat pavilion, hugely adored and popularized as ‘Jagannath Ghat’, or ‘Juggernath Ghat’ mainly as publicity materials, had functioned as the Juggernath Steamer Ghat as well. Gustav Boehm’s Voyage Around the World advertisement for Toilet Soaps and Perfumeries with photograph of ‘Public Bath’. No Mention of Chatulal Ghat or Jagannath Ghat. Before looking into it, we may need to review the status of the old Sobharam Basak’s ‘Jagannath Ghat’ of Barabazar. The ghat built by Sobharam Basak, ‘one of the wealthiest native inhabitants of Calcutta in the eighteenth century’ [Cotton], was initially called ‘Sobharam Basak’s Ghat, শোভারাম বসাকের ঘাট, and shortly after changed into Jagannath Ghat as shown in the published maps. Sobharam built the Ghat around 1760s by the side of the Jagannath Temple he had erected at 1, Nabab Lane. Sobharam’s Jagannath Ghat was present in all the historical maps of Calcutta since Mark Wood’s Plan. The Ghat originally built by Sobharam, might have been washed away into the river and replaced by a shaded structure with stepped embankment for public bathing of no particular significance from the view of public interest. Since the pavilion, represented in all the photographs displayed here, has already been identified beyond doubt as of Mullick Ghat, from where steamboats set off to near and far places to Assam and Orissa with freights and passengers and pilgrimage to Jagannath, it’s not unimaginable to have the ghat/ jetty called a ‘Juggernath Ghat’ too. ETH Studio Basel, C. (2008). River Edges of Kolkata. Retrieved from http://www.studio-basel.com/assets/files/05_River_web.pdf.